Through an unfortunate and short sighted decision, the Forest Advisory Committee of the Ministry of Environment and Forests has gone back on its decision of rejecting Forest Clearance to Kalu Dam that it took on 2nd April 2012. It reconsidered the project and in its last meeting on 3rd-4th April 2013, and has actually recommended the Kalu Dam project for FC, involving 1000 hecatres of Forests in the Western Ghats. It has done this when all the illegalities and irregularities from the proponent still stand today, entirely unaddressed. You can support the communities and Forests in Kalu by sending similar letters to MoEF Minister and Forest Advisory Commitee. Subject: Request not to grant Forest Clearance to Kalu Dam in Maharashtra due to several procedural and legal irregularities on the part of the Project Proponent and also the Forest Advisory Committee. This is to express our utter shock and dismay at FAC’s decision of recommending Forest Clearance to Kalu Dam falling in Western Ghats area in Murbad, Thane District, Maharashtra as seen in the minutes of the FAC meeting of April 3-4, 2013. Just one year ago on the 2nd of April 2012, the Forest Advisory Committee had rejected this proposal, raising substantial points against the proposal and closed the file. This was a respite for the communities facing displacement, community groups working on the issue, for the Western Ghats ecology and the forests. We had then thanked FAC for this decision of April 2012. On 4th of April 2013, the same Forest Advisory Committee (now with a changed constitution) went back on its decision and recommended Forest Clearance (FC) to Kalu Dam even when nothing has changed on ground and all of the objections based on which FC was rejected in the first place still stand today. The Project Proponent (PP): KIDC, Maharashtra Water Resource Department, has not been able to respond in credible way to any of the points raised by the FAC, Chief Conservator of Forests (Central), State Forest Department, affected villagers or civil society organisations. We strongly condemn this decision by the FAC of recommending Forest Clearance for diverting nearly 1000 hectares of Forests in the Western Ghats. We urge you (i) not to recommend FC for Kalu Dam; (ii) request you to take steps to make Forest Advisory Committee more transparent, responsive and accountable to issues of communities and forests; specifically, all the documents from the project proponent, including all the annexures of the Form A and gram sabha resolutions for the projects on FAC agenda must be on FAC website at least ten days in advance as per CIC orders and as also assured by you in public; (iii) We also urge you to direct action against those responsible for illegal construction of the Kalu dam as noted by the FAC minutes; (iv) urge you ask FAC to hence forth recommend strict action against such violations. Considering that the lives and livelihoods of about 18000 people will be affected by this project, and when they have the first and foremost right to have all the information on decision making around this project, such irresponsibility on the part of FAC is unacceptable and it is also bad in law. Petition against Kalu Dam is in the High Court of Bombay currently and this point will be raised there. Complete reliance on Project Proponent’s (PP) claims While recommending FC, the FAC has relied entirely on claims of the proponent, without checking the veracity of the claims or applying its mind. FAC has not even mentioned the numerous submissions made by communities and community-based organisations raising pertinent points against PP’s claims. The FAC needed to keep in mind that the same proponent has gone against its word many times earlier and each time, it has been pointed out to the FAC. It has wilfully violated the Forest Act by starting construction of the project in the absence of FC when the project is to submerge nearly 1000 hectares of land in a biodiversity hotspot, it has gone against its written word when it said that ‘no new project will be required for Mumbai until 2031”, in the process of seeking Stage I Forest Clearance for Shai Project, barely 20 kilometres from Kalu Project. But the FAC, instead of taking any strict action against the proponent in this regard, has simply accepted its claims, which are again misleading and false. · No Gram Sabha Resolutions Passed supporting the project: Misleading the Forest Advisory Committee: PP has claimed that it has secured Gram Sabha Resolutions from 8 villages out of the 11 villages that will be fully or partially submerged by the dam. In fact, Shramik Mukti Sangathana has letters from 10 Gram Panchayats out of these 11 that they have not issued any such resolutions at any stage. The last resolution in this regard that they passed was AGAINST the project. These were sent to the FAC on 16.11.11. If the Project Proponent has the resolutions as claimed, why have they not put these up on the FAC website with the necessary documentation from the PP? Why did the FAC not see the need to ascertain this even when it was pointed out by us in our letter dated 29.10.12 and again in 25.03.13 that no such resolutions exist? · Clear violation of the Forest Conservation Act (1980): The proponent accepts that it violated the Forest Conservation Act (1980) by starting work before an FC, but states that it stopped AFTER High Court Orders. High Court Orders were in response of a PIL filed by Shramik Mukti Sangathana against the illegal nature of the work. So, stopping AFTER HC orders is no justification for committing the illegality. Before the High Court orders, Shramik Mukti Sangathana had written several letters about this violation to the Collector, Chief Secretary and Forest Department and had also served a notice to the PP. It did not stop work then. Considering this, the Forest Advisory Committee ought to have penalised the project proponent for violation of Forest Conservation Act (1980), not recommend the same project for clearance.This only gives out a signal that no action will be taken by the MoEF even after it knows that violation of Forest Act is happening, that too by a state agency. · Continued violation of the Forest Rights Act (2006) It has been pointed out several times to the FAC that Kalu Project is violating the Forest Rights Act (2006) as community and individual claims are yet to be settled. The Forest Rights Act was passed to safeguard historical injustice on Forest-dependent communities, but the FAC itself is encouraging the PP to violate FRA, PESA, Rehabilitation Policy and Forest Conservation Act. You, as a Minister, had reasserted MoEF’s commitment to implementation of Forest Rights Act. · No Rehabilitation Plan has been submitted at the time of recommending Forest Clearance There is no such plan available in public domain, nor has there been any participatory process of approval of the plan with the affected people. A claim of a rehabilitation package of Rs 68.75 Crore does not constitute a Rehabilitation Plan. This point was raised several times by community organisations, State Forest Department, Chief Conservator of Forests as well as the FAC. Villages to be affected by Kalu Dam fall in Tribal Subplan and attract PESA. Without any legally mandatory process, just the claim of rehabilitation package of Rs 68.75 crore seems good enough for FAC. It was clearly wrong on the part of the FAC to recommend FC based on such claims. 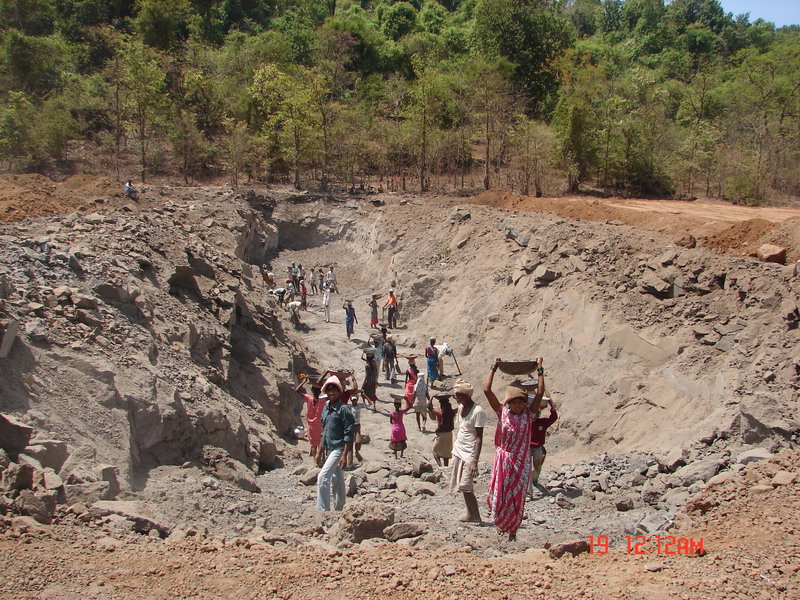 · Konkan Irrigation Development Corporations letter that “it is not necessary to construct any new water source till 2031”: This was submitted to the MoEF while seeking Stage I Forest Clearance for Shai Dam, less than 25 kms from proposed Kalu dam in 2010-11. FAC recommended Stage I Clearance to Shai Dam based on that assurance. In less than 3 years, the proponent feels that Shai dam, whose clearance was obtained on such a claim, will not be sufficient till 2031. This is unjustifiable and tantamount to misleading the FAC with false assurances. · No Environment Impact Assessment (EIA) Conducted The Kalu Dam falls in ecologically sensitive Western Ghats. The Western Ghats Expert Ecology Panel had categorised the region in ESZ I where no large dams should be permitted. Even as per the Kasturirangan Committee Report, more than 5 villages affected by Kalu Dam are falling in the ESA. The State forest Department, Chief Conservator of Forests (Central), community groups have all urged that EIA as well as a Cumulative Impact Assessment of the Project has to be done before granting Forest Clearance. In fact, this was one of the conditions laid by the State Forest Department. Looking at the ecologically sensitive location of Kalu Dam and submergence of nearly 1000 hectares of Western Ghats Forest Land, this was a reasonable expectation. Despite these clear conditions, the PP argues that EIA is not required. And despite this, the FAC recommends FC to this project! In this context, Section 2.3 (ii) of FCA (1980) read, “Notwithstanding the above, if in the opinion of the Ministry or the Advisory Committee, any proposal should be examined from the environmental angle, it may be required that the project proponent refer the case to the Environment Wing of the MOEF.” So irrespective of the requirement of EIA notification, the FAC has been provided powers to refer to an such project to the environment wing of MoEF or EAC for examination of the project from the environment angle, but FAC failed to do this just under the claim of the PP that EIA is not required under EIA notification. FAC recommendation that Cumulative Impact Assessment has to be undertaken for drinking water projects around Mumbai is welcome but again, it could have been done before considering this project for clearance and not after recommending clearance. Similarly their recommendation to the MoEF to amend the EIA notification to ensure that such dams are included for environmental impact assessment is welcome, but they could have waited for MEF response rather than recommending Forest Clearance. In this regard we urge you: (i) immediately change the EIA notification to include Kalu and all such large dams under the ambit of the EIA notification, irrespective of the purpose of the project; (ii) Direct specifically that Kalu Dam require EIA and Env clearance, using the above mentioned part of the Forest Conservation Act, 1980 and EPA, 1986; (iii) Order a cumulative impact assessment of all the projects in the western ghats region around Kalu dam, as recommended by FAC and (iv) direct that FC for Kalu will NOT be considered till all these requirements are fulfilled. · Forest Conservation Act requires Gram Sabha clearance Moreover, section 2.1(vii)(4) of the Forest Conservation Act, 1980 clearly states: “Therefore, whenever any proposal for diversion of forest land is submitted, it should be accompanied by a resolution of the ‘Aam Sabha’ of Gram Panchayat/Local Body of the area endorsing the proposal that the project is in the interest of people living in and around the proposed forest land except in cases wherever consent of the local people in one form or another has been obtained by the State or the project proponents and the same is indicated in the proposal explicitly. However, it would be required where the project activity on forest land is affecting quality of life of the people residing in nearby areas of the site of diversion; like mining projects, displacement of people in submergence area, etc.” This provision is particularly applicable to a project like Kalu that has not had EIA or public hearing as stated in the same section in FCA, 1980. Recommending FC for Kalu Dam project without fulfilling this requirement is clearly a violation of the FCA, 1980 by the FAC. We urge you to direct the project proponent to get gram sabha resolutions on the lines mentioned above in FCA Section 2.1(vii)(4) and direct FAC consider the project only after these have been received. · Distance from Protected Area: The submergence of the project is less than 10 kms from Kalsubai Sanctuary. Considering the fact that no EIA is conducted, no report on Wildlife Status exists, this makes ecological impacts of Kalu Dam on Western Ghats ecosystem even more serious. Considering all these issues, FC should have been rejected on this ground alone. In fact the PP goes ahead to say: “No rare or endangered flora or fauna has been reported from this site” How can this be stated when no EIA has been conducted and no wildlife report exists? · The PP states that only “44566” and “44611” that is ‘only’ 89177 tress will be felled during and the rest ‘may be’ saved. Ninety thousand trees in Western Ghats is a huge number. But it seems FAC does not see any objection in this. The claim that the rest of the 60 000 trees can be saved is of doubtful credibility. Similarly the claim in the FAC meeting minutes that “No rare or endangered species of flora and fauna has been reported in the area” is also without any credible basis. · We would like to reiterate that no options assessment about water supply options to Mumbai has been done. No consideration of rainwater harvesting, using saline water for some uses, grey water recycling, demand management, water use efficiency, and conjunctive groundwater use has been done. The FAC minutes notes this, but from the minutes it seems it has not applied its mind to these issues and recommended FC as a matter of blind support for the project. The mention of the letter from the Chief Minister in the minutes only adds to the suspicion that the FAC has cleared the project without looking into merits of the issue. · Contradictions in FAC conditions? The FAC has recommended FC to the project, with some additional conditions, one of the additional conditions states: “The User agency will abide by all conditions by Regional Office, Bhopal and State Government during inspection of the project.” So the PP has to adhere to all the conditions imposed by the Regional Office, Bhopal and the State forest Department while inspecting the project. We seem to be in a funny situation now. The FAC, while recommending FC, put a condition that says that decision of FC should not be taken without “proper scientific documentation and studies”, but FAC has done just that! In any case, one implication of this is that the project should not get even first stage FC without the studies recommended by Regional Office, Bhopal, including EIA has been done. Similarly the State forest department too has asked for (i) Rehabilitation Plan (ii) EIA (iii) technical report from WII on impact of project on wildlife in and around the project area (iv) gram sabha resolutions from all affected villages under FRA. The project should not thus be given even stage I clearance without satisfaction of all these conditions. Most of these issues have been brought to the attention of the FAC time and again by us, Shramik Mukti Sangathana and other community groups. However, the FAC still went ahead with the incomprehensible decision. Hence, we are writing to you with the hope that after looking at all the points raised above, you will definitely not recommended Forest Clearance to Kalu Dam. We also hope that MoEF will punish violators of FC and FRA Acts to send a strong signal and will take steps to make the present Forest Advisory Committee more transparent, accountable and responsive to issues ailing our forests and forest-dependent communities. Previous Post How much does the Kasturirangan Committee understand about Water Issues in Western Ghats?